Relax here your whole vacation, floating on the ocean on inflatable chairs, or lounging on the moored floating dock in front of the cottage. There are several beaches nearby: walk to our small one a few yards away, or to the Mill Cove Beach up the road about (3/4 mile). You can also pack a picnic lunch and drive to Fox Point Beach (2 miles), Bayswater Beach (9 miles), Queensland Beach (8 miles), Cleaveland Beach (12 miles), etc. etc. Take sight seeing day trips to Peggy's Cove, Chester, Mahone Bay, Lunenburg, Halifax, Annapolis Valley, Blomiden Point, Blue Rocks caves.....all within easy commute. 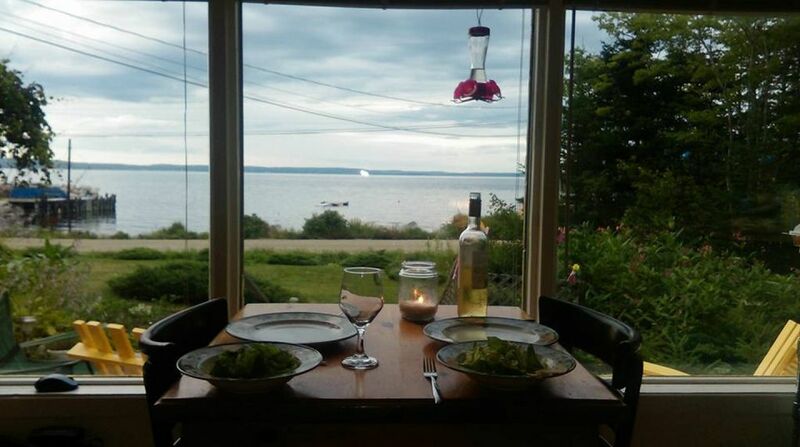 Tour wineries, bike around the peninsula, hike on the trails, go on whale watching tours, St. Margaret's Bay boating trips, golfing, Theatre, restaurants, Lola's Landing (wonderful local shop), Hubbards Saturday Farmers Market, lobster suppers, or dance to live bands at our famous Shore Club. The open concept, bachelor sized cottage comes equipped with a queen bed, as well as a single fold up cot. There is a 3 piece bathroom which includes a stand-up shower stall. All towels and linens are supplied, including beach towels. There is a TV (with cable) and a DVD player supplied. Free Wifi is also provided. The kitchenette contains a full sized stove/range and refrigerator with freezer. All small appliances, including toaster, coffee maker, kettle, blender, hair dryer, iron, curling iron, are supplied. Besides the dishes, pots & pans, cutlery, it is well equipped with practically everything a large house would have in it. Outside, a Bar-B-Que is ready to fire up. There are also 2 cushioned chairs in which to sit outside to enjoy the beautiful view and breathe the fresh ocean air, listening to the seagulls (and the babbling brook along the side of the cottage) while enjoying your morning coffee. A big fire pit in the backyard provides a chance to cook hotdogs, smokies, smores, and roast marshmallows. This little piece of Paradise is truly worth the visit!! There is to be no smoking on property. Also, no pets are allowed. * Approximate Monthly rates, actual rate will depend on the days of the month you stay Extra person fee of 30 per person per night after the first 2 guests.